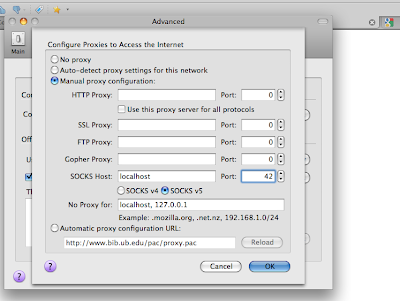 And then set Firefox to use a proxy. In preferences, go to the Advanced Tab and select Connection Settings. Here you should select manual proxy configuration, in localhost with the same port number (42 in this example) as you used up before. Now you can browse as if you were browsing in YourRemoteMachineName. See the figure for more information.